Oconaluftee is another place on the NC side of the Great Smoky Mountains. It's near Cherokee, NC, and has one of four visitors' centers in the Park (the others are Cades Cove, Sugarlands, and Clingmans Dome). It is also the main entrance to the Park on the NC side. A Cherokee Village once stood on/near the site of the visitors' center, and may have been destroyed during the American Revolution. It is also believed to be the only permanent Cherokee village that is within what is now the Park. Near the Visitors' Center, there is a large campground (Smokemont), which was once a logging community. The nearby trail connects with the Appalachian Trail near Clingmans Dome. The Blue Ridge Parkway is also nearby. In Cherokee, NC, there is an Oconaluftee Indian Village which is very popular. The Mountain Farm Museum is adjacent to the Visitors Center, and includes a cabin, barn, meathouse, applehouse, chicken house, corn cribs, a spring house, and, of course, Mingus Mill. The Oconaluftee River Trail is more of a walking trail. Dogs are allowed on this trail, which begins at the Visitors Center and ends near Cherokee. Joggers and bicyclists can also be seen on this trail. The area is now included in the National Register of Historic Places, as of 1982. You don't find a lot of trails in national parks that allow dogs so it must be a nice gentle path. Sounds like another great place to visit. I'm starting to feel the need for a trip later this summer. Looks/sounds like a great spot! Stopping in from A-Z :) Good luck with the rest of the challenge! 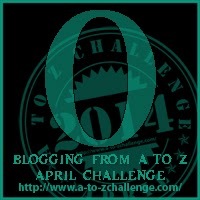 Visiting with A-to-Z Challenge, I love combining history with some nature parks. If I am ever that way, I will have to stop by there.